Larry Ferrell died as he lived changing the world. The legendary founder of the social network Headspace, which connects nearly everyone on the planet, Ferrell gave away his entire fortune on his deathbed 18 billion dollars, evenly divided between 140 randomly selected strangers. With the money came one simple condition: if any of the recipients dies, their shares are automatically redistributed to those still alive. The result? Kidnappings. Accidents. Murder. Slowly but surely, the 140 are dwindling, and no one not the rich and famous socialite, not the strangely prescient guru, not the tough-as-nails reporter is safe. But death is not the end that it might seem. Behind this sinister experiment is a secret that Ferrell kept from everybody, including those responsible for the 140 program and now all the masks are about to come off. 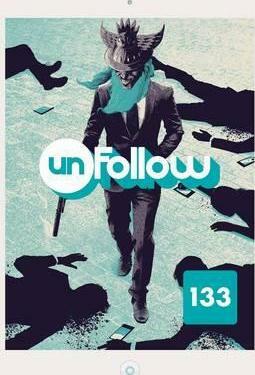 Collecting issues #7-12 of the acclaimed Vertigo series, UNFOLLOW VOL. 2: GOD IS WATCHING brings a new level of savage insight to Rob Williams and Mike Dowling s razor-sharp thriller, with special appearances from guest artists Marguerite Sauvage and Ryan Kelly."